Create Send UK | How do I add a forward-to-a-friend link? How do I add a forward-to-a-friend link to my campaigns? A forward to a friend link encourages your recipients to pass your campaign around to other friends and colleagues. 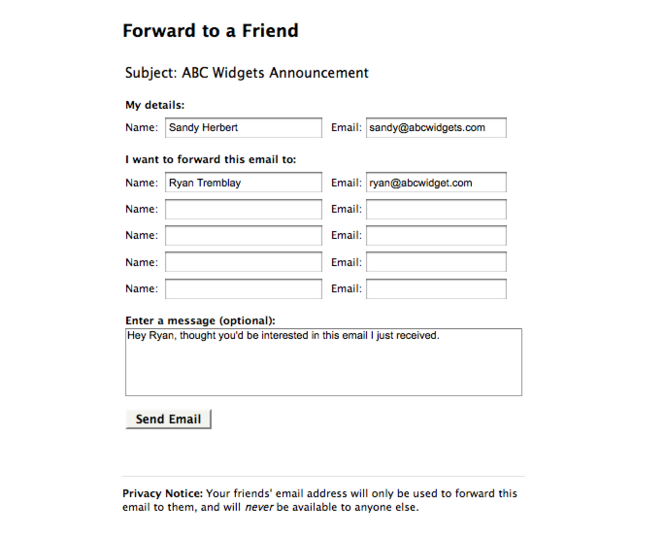 When a recipient clicks your forward to a friend link, they are taken to a simple page (pictured below) where they can specify the names and email addresses of up to 5 friends at a time to send your campaign to. This page is non-branded and located at our forwardtomyfriend.com domain. The best part is, you can track who is forwarding your campaign and how many people they are forwarding to from your campaign reports. When your campaign is sent, these links will automatically be converted into a custom forward to a friend link. By adding a style="" attribute to the forward to a friend tag, we will automatically add that inline CSS to the link for each of your recipients. How do I measure these forwards? If you send a campaign with a forward to a friend link, a Forward to a Friend Activity Report is available in your campaign reports. This report lists all the recipients that forwarded your email, as well as how many people they forwarded it to. Please note that this report will only be available after a recipient forwards your campaign. You can completely customize the look of this page to match your clients branding. On a per client basis you can add a header image, change the default font, give the page a new background color etc. Jump into the "Manage Clients" section, click on the client you want to update and you'll see a new 'Customize the Forward to a Friend page' option. How do I personalize a campaign? Why should I test my campaign before I send it?